Ticks are parasites that bury their mouth parts under a cat's skin and feed off your cat's blood. Unfed ticks are tiny, have eight legs, and vary from black, brown, red or tan coloured. Once they have attached and fed from your cat, their grey bodies swell up to the size of a pea. In the UK the most common ticks are the sheep tick (Ixodes ricinus), hedgehog tick (Ixodes hexagonus) and dog tick (Ixodes canisuga). Humans can also be bitten by ticks. Some ticks can also transmit diseases (eg Lyme disease), although this is less of a problem in the UK. 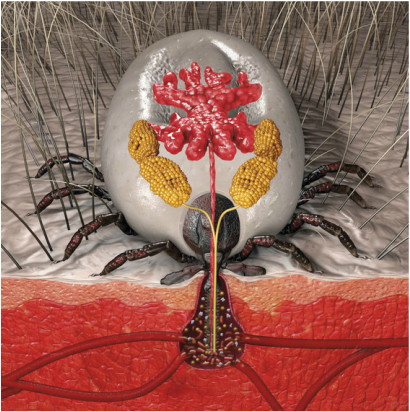 Ticks are often confused with teats or small warts, particularly when they have recently fed and are engorged with blood. They are often seen around your cat's head and neck as they are usually picked up from walking through grasses/undergrowth. If they have been attached for some time, they may cause some irritation at the site of the bite. It is really important that you do not pull a tick out as you may leave the head/mouth-parts behind resulting in infection or inflammation. 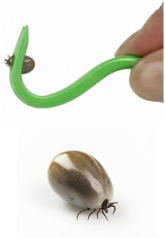 I can provide you with a specially designed tick removal tool that removes the entire tick and can show you exactly how to use it correctly or simply watch Steve Leonard in the "It's a Jungle Out There" video below. When you have removed the tick, check it’s head and legs are present and there is nothing left at the level of the skin. If you are worried something was left behind we can always check your cat over. Some flea products also kill ticks and some provide some protection against them, although they may require more frequent application than needed for protection against fleas. You may still need to remove any dead/dying ticks from your cat that have remained attached. 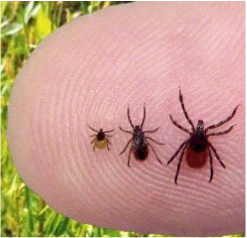 You might sometimes encounter baby ticks (nymphs) or even adults that have not yet fed yet (like those to the right). These are substantially smaller than a fully fed (engorged) tick and should not to be mistaken for a tiny spider!